Aloha & Congratulations on Your Special Occasion! Beauty is our passion and creating the most exquisite makeup & hair designs is what we love to do. Our goal is for you to feel not just beautiful but feel yourself and reflect confidence. 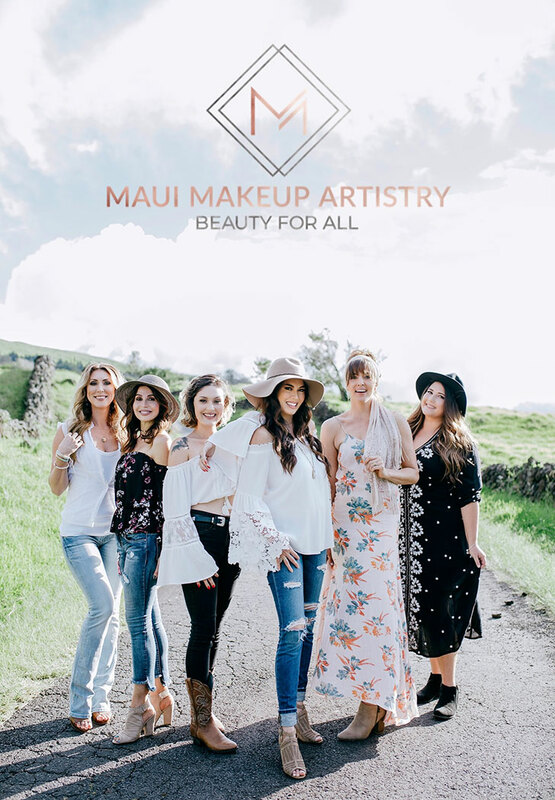 Maui Makeup Artistry offers a calm, care free, professional environment so your surrounded with comfort and bliss. Weather your a Natural, Classic or Glamorous Bride our team will customize your look to compliment your features, skin and hair type. Our styles emulate the latest trends and we only use elite products to deliver longevity in our tropical climate. With a team of 6 no wedding party or group is too big for us to accommodate. Beauty for All is our motto as there is no limit to who we can beautify. All ages, cultures, sexes, and ethnicities are welcomed. We specialize in cultural weddings such as Chinese Tea ceremonies, Indian weddings and Women of color. Our team has a true passion to acknowledge our clients needs and most of all reflect Aloha spirit throughout the experience . If it’s your wedding day we are honored to share the first surreal moments with you here on our magical island and can’t wait to meet you !